Portland Women in Technology (PDXWIT) exists to give women a forum in which they can connect, learn and grow. The power of community is profound, and we are always looking for ways to expand and extend that power to other organizations around the city. That’s why the winners of the first-ever PDXWIT Annual Awards Program were asked to choose an organization to which we’d donate funds in their name. The Awards Program consisted of a process of community nominations and panel selections, and in the case of the Best Speaker award, a lightning talk runoff at the Women + Tech Holiday Party. 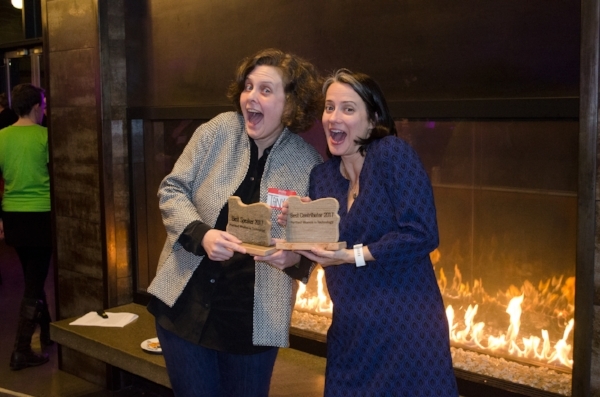 As a result, we were thrilled to name Katharine Nester as Best Contributor and Tanya Crenshaw as Best Speaker. We asked Katharine and Tanya to each select a local nonprofit serving women and girls, to receive $2,000 from the PDXWIT Community fund. Katharine's choice was the Girls Inc., Eureka! program and Tanya's choice was Rose Haven. "I'm honored to translate my contributions to PDXWIT into support for another organization focused on empowering girls and women in tech," said Katharine Nester. "The Girls Inc. Eureka! Program is an actionable initiative, making real progress for diversity in the pipeline of talent for our industry. I hope this heartfelt donation continues to fuel that progress." "I am honored to be recognized for my PDXWIT contributions, but I'm even more grateful that PDXWIT is making a donation to Rose Haven," said Tanya L. Crenshaw. "It is important to me that every one of us commit to doing something each day to scrape a little crud off of our part of the world. PDXWIT is a grand example of this commitment." Rose Haven is a day shelter serving women and children that are without home, are being abused or are facing other trauma. Rose Haven provides meals, showers and necessities to these women while also advocating for them. The goal of our awards program is to feature one individual for the contributions to our community and one individual for their speaking abilities. It’s our honor to also share these generous contributions of time and talent in the form of monetary donations to like-minded organizations.